Lakeview, we’d like you to feel welcome! 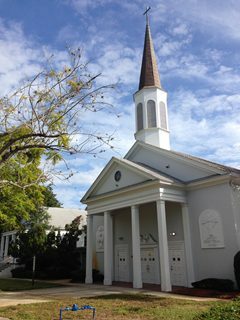 You’ll find us in the sanctuary, which is through the main doors and on the other side of our Fellowship Hall. The service will begin at 10:30am with a musical prelude, followed by a welcome from Pastor Lois. If you have not found your seats before this begins, this is the signal that the service is about to start. You can expect a mix of traditional Presbyterian hymns, hymns from the African American Heritage Hymnal, and contemporary music led by our pianist and choir – a reflection of our diverse congregation. We share a potluck meal after services every 2nd Sunday of the month. Don’t feel like you have to bring something to share - you are absolutely welcome and invited to get to know us the best way we know how – over food! When the dates fall so that there’s a 5th Sunday in a month (March, May, and August in 2015) we share a very special service together called an Agape Feast. An Agape Feast is a very old tradition in the Christian Church, and it means that we worship over a meal, the way the disciples and the early Christians did! On an Agape Feast Sunday, we worship in our Fellowship Hall, the room right inside the main doors. Come in and pull up a chair. The service will begin as usual at 10:30am, though we’ll be seated around tables instead of sitting in pews. During the part of the service where a sermon usually takes place, we instead fill our plates with the food provided (by the church as well as goodies brought by members of the congregation as well) and participate in a guided discussion and prayer time with the neighbors at our table. Agape Feasts are a great way for us to continue to grow together as one Christian Family, and the food is always wonderful! As with Potluck Sundays, if your visit with us falls on an Agape Feast Sunday, please just bring yourself and let us share our bounty with you! “Let the little children come to me,” said Jesus. We feel the same way at Lakeview! Children of all ages are welcome to stay with you during the service. We have a number of energetic little ones who participate in worship in their own joyful (and sometimes fussy!) way. We provide age-appropriate Worship Bags to keep little hands busy during the service and to help them to participate in worship on their level. These are kept on a table just inside the front doors - if you can't find them, please don't hesitate to ask for one! 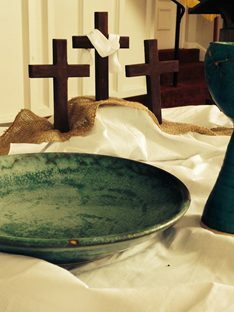 Communion at Lakeview occurs on the first Sunday of each month, and is usually distributed through a method called “Intinction.” When Communion begins, you will be invited to come forward and take a piece of bread (large, because Christ’s grace is abundant for us!) and dip it into the chalice of grape juice, and eat. Communion is a powerful part of the Christian life, so we ask that participants maintain a period of quiet reflection as all come forward. We practice an open table at Lakeview, which means that all who call Jesus Christ their Lord and Savior, regardless of background or religious affiliation, are welcome at the table.